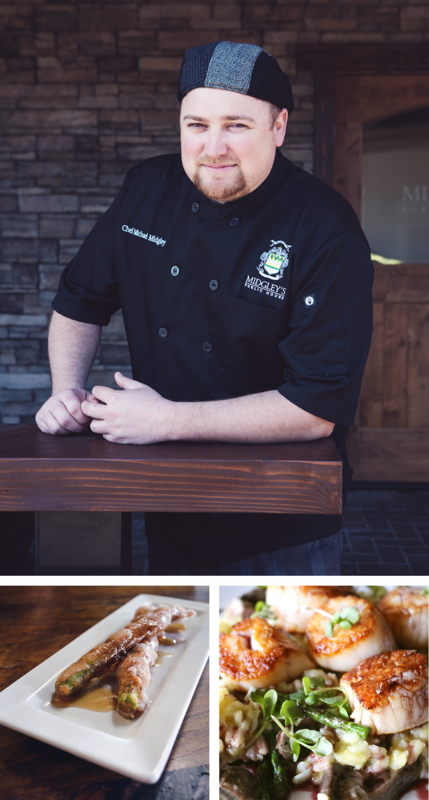 Catch up with the Stockton native for his perspective on the annual Dine Out. With two more weeks remaining in the sixth annual Great Stockton Asparagus Dine Out, hungry scores of foodies and curious patrons alike are flocking to many of Stockton’s celebrated restaurants to sample exclusive asparagus-centric menus. Among the many participants is Midgley’s Public House in Lincoln Center, where acclaimed chef Michael Midgley is serving up special gourmet dishes showcasing none other than the beloved spear itself. We caught up with the Stockton native to find out how the Dine Out is going from a Top Chef’s perspective. Q. Thanks so much for talking with us. So, how has everything been going so far? A. It’s been going really well. People are jazzed about the event and it’s been really busy around here. Q. That’s great! What has been the most popular dish? A. Definitely the asparagus mushroom risotto. Q. That sounds delicious. What’s in that? 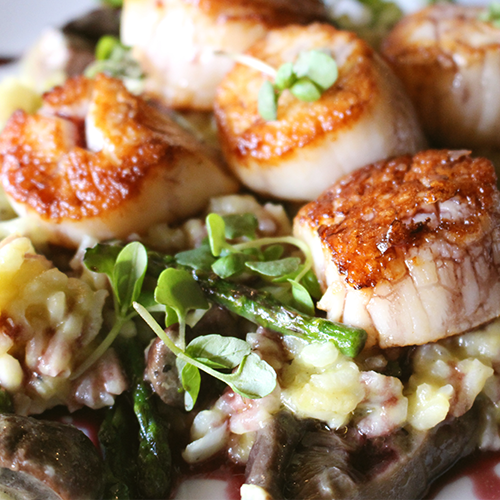 A. Sautéed scallops, asparagus mushroom risotto and port reduction. Yeah, it’s been a big hit. Q. How many years have you participated in the Dine Out? A. Well, I, personally, have been participating my whole life. I’ve been eating local asparagus all my life. At Ernie’s [Food and Spirits, where Midgley was executive chef before opening Public House] we didn’t do it. This is the first year for Midgley’s Public House to do it because we just opened in December. Q. Do you notice a change within the community when the event is going on? A. Yeah, definitely. Everyone is really looking forward to it. Everyone wants to know what is offered and what’s been grown locally. Q. Especially for the local farmers, one could assume? A. It’s a great event for local farmers. They come in a lot—I have a lot of friends who are local farmers and they come in and eat. They like seeing what we do with their veggies. Q. When April is over, will any dishes stay? A. Yeah, we’ll probably keep all of them. Sometimes people come in and are like, “Asparagus isn’t even in season,” but you can’t please everyone. If it’s a good dish—if people like it—it stays. We’ll just have to get our asparagus elsewhere when it’s not in season. Q. But can you taste the difference? A. A little. There’s always something about food that comes from right around you. Q. How hard is it to have to creatively incorporate asparagus into these dishes? A. Veggies aren’t hard, and I would say asparagus is definitely the easiest. A. Just throw on some salt and pepper and throw it on the grill. I say it is best al dente. Q. Who would you say is more open to trying things, kids or adults? A. We don’t get a lot of kids in here, although our restaurant is kid-friendly. But I’d say a lot of people are pretty adventurous eaters. Also, people know what they’re getting into when they come during the Dine Out. Q. Do your own children give ideas or inspiration for dishes? A. My daughter approves of the asparagus churro. A. It’s a deep-fried asparagus churro covered in maple syrup and cinnamon sugar. Yeah, [laughs] she could eat a bunch of those. Q. Last but not least, what is your personal favorite way to eat asparagus? A. My favorite way would have to be a way I’ve eaten them for years, which is just taking asparagus and cream cheese and wrapping them up like a wonton; like in an egg roll. At Midgley’s Public House, we call them asparagus cigars and serve them with a sweet chili sauce. There’s still plenty of time to get your asparagus on and enjoy the Great Stockton Asparagus Dine Out through the end of April. Make sure to visit Stockton’s official GSADO page to view all the participating restaurants. Make your own contributions by posting pictures and tweets using the hashtag #GSADO for your chance to win a gift card to one of the participating restaurants. Follow all the updates on Facebook, Twitter, and Instagram.